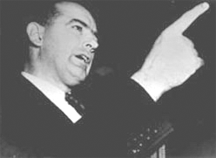 Senator Joseph R. McCarthy (Democrat of Wisconsin), Senator from January 3, 1947, through May 2, 1957. He was a renowned bully who had made a career of accusing notables and government employees of associations with the Communist Party. Following his re-election in 1952, he was made Chairman of the Senate Committee on Government Operations, which was thought to be a less-visible position where he would be relatively unable to continue his more outrageous bullying patterns. But this committee included a subcommittee, the Senate Permanent Subcommittee on Investigations, which he bent to his will. Beginning in April, 1954, in 36 day of hearings televised by all three networks, he accused hundreds of people of treason and subversion, destroying countless careers and sometimes lives. But in one famous exchange with Attorney Joseph N. Welch, he met his match. On the thirtieth day of the hearings, on June 9, following a truly outrageous provocation by Sen. McCarthy, Mr. Welch confronted the bully with calm restraint. The hearings went on for six more days, but they were finished. The Senator's career unraveled rapidly thereafter. He was censured by the Senate on December 2, and his career was ruined. Listen to the exchange between McCarthy and Welch. Photo courtesy United States Senate. Workplace bullies select targets carefully, focusing on those who can't or won't fight back, because bullies fear counterattacks. If you've been targeted, the bully probably believes you won't fight back, and, paradoxically, that's the key to successful confrontation. Here is Part II of our series on confronting the workplace bully, including six tips for managing an effective confrontation. See "Confronting the Workplace Bully: I," Point Lookout for February 3, 2010, for more. You probably can't "fix" or instruct or improve the bully, because you haven't been asked to. But you can force the bully to find another target, or at least, cease targeting you. That is a clear, achievable objective. It can't be achieved in one dramatic incident. Prepare for a campaign — a series of small face-offs. As you begin formulating a campaign, you'll feel an urge to counterattack immediately in small ways. Resist the urge. Bullies sense these changes. If you counterattack before you're really ready, the bully can prepare for whatever you finally decide to do. Strategic surprise is a significant advantage. Maintain the posture of a helpless target until you can suddenly apply overwhelming force. See "Biological Mimicry and Workplace Bullying," Point Lookout for March 31, 2010, for more. While physical bullying does occur, most workplace bullying is psychological, consisting of rumors, lies, shunning, innuendo, exclusion, humiliation, shouting, insults, and more. Avoid physical confrontation, because criminal charges are likely. Tactics for effective counterattacks depend on the tactics of the bully. Choose an approach at which you're more skilled — or can become more skilled — than the bully is. ways. Resist the urge.confrontation incident, choose between initiating and responding. In private, initiating the confrontation is a powerful display of confidence and courage. Without witnesses, you have more tactical freedom. In public, wait to be attacked, and respond powerfully. If you counterattack in public without provocation, you might seem yourself to be a bully. Provocation by the bully is essential to success in public counterattacks. Choose the setting for counterattacks carefully. The most favorable setting is either private or one in which most onlookers are hostile to the bully. Don't expect open demonstrations of support, because bullies make such demonstrations risky for your supporters. All you need is a few witnesses who are willing to say that the bully provoked you, and that you acted reasonably. Screaming, tears, and other expressions of emotion reduce your chances of success. A cool, deliberative posture says, "I enjoy making trouble for you, because you've made so much trouble for me." It shows that you can carry out your plan for as long as necessary. The goal of counterattack is to demonstrate that bullying you will be an expensive, painful affair. Coolness emphasizes and supports that message. Would you like to see your comments posted here? rbrenlvHCQjNALheGmEjLner@ChacVsYoCqvBybvTBcOmoCanyon.comSend me your comments by email, or by Web form. I offer email and telephone coaching at both corporate and individual rates. Contact Rick for details at rbrenJWecuYmWUHSEHhduner@ChacZNEAEgSzwlqziCnXoCanyon.com or (650) 787-6475, or toll-free in the continental US at (866) 378-5470.